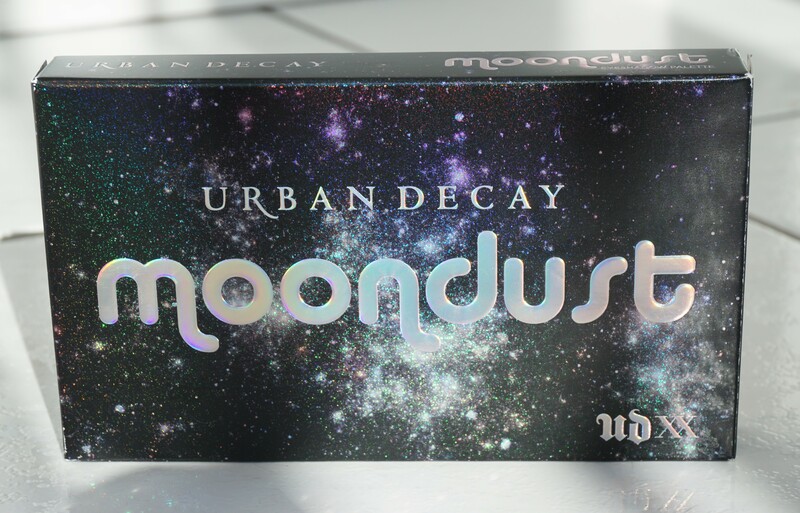 If you are a fan of the Urban Decay Moondust eyeshadow singles or if you have always fancied trying them, then the new Urban Decay Moondust Eyeshadow Palette could be right up your street. Eight eyeshadows which contain the perfect mix of colour, pigment and sparkle – what’s not to love? The good news is that this palette is permanent, so you can take your time in considering if it is a must-buy for you (it was for me!). 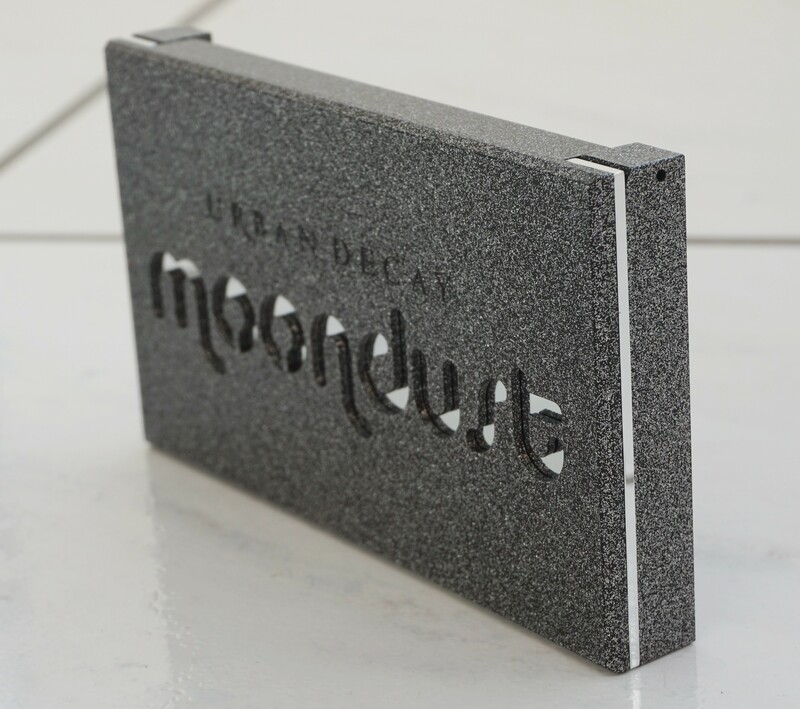 The Urban Decay Moondust Eyeshadow Palette comes in a black box with a sparkly, space dust effect. The front of the box has the brand name and the palette name across the front. 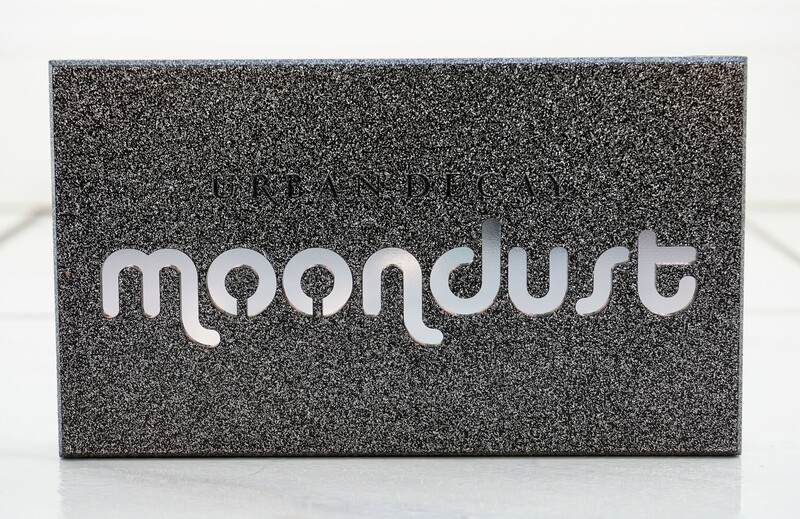 The packaging is really cool, as the space dust design pops out as green, silver and purple shimmer when it catches the sun. The writing also takes on a holographic silvery-green hue in the light. I noticed the sparkly, holographic effect when I was taking pictures of the box in the sunshine – it looks so pretty! The back of the box provides a shade spectrum, along with names, of what is contained in the palette. I like this design feature, as it really gives you a feel for what shades you are getting in the palette before you even open it up. The back of the box also suggests that the eyeshadows can be applied with your fingers or used wet for maximum payoff. The back has the same cool feature as the front, in that the shade spectrum shimmers and glimmers when it catches the light. The palette itself is gunmetal grey in colour. It feels light in the hands but is still nice and sturdy. The palette sparkles and shimmers when it catches the light. As you can see, there is a theme of sparkle and shimmer through all of the packaging! The brand and palette name are written across the front in silver lettering. The back provides the distribution information and the weight of the eyeshadows contained in the palette. The palette is a lot smaller in size than the Vice palettes and the Naked palettes. It measures just under 9cm/6 inches x just under 15cm/3.5 inches in size, making it quite nice and small for storage purposes. Now for the inside of the palette (my most favourite part!!). The palette has a small nook at the front for opening the palette and a magnetic enclosure to keep it secure when closed. 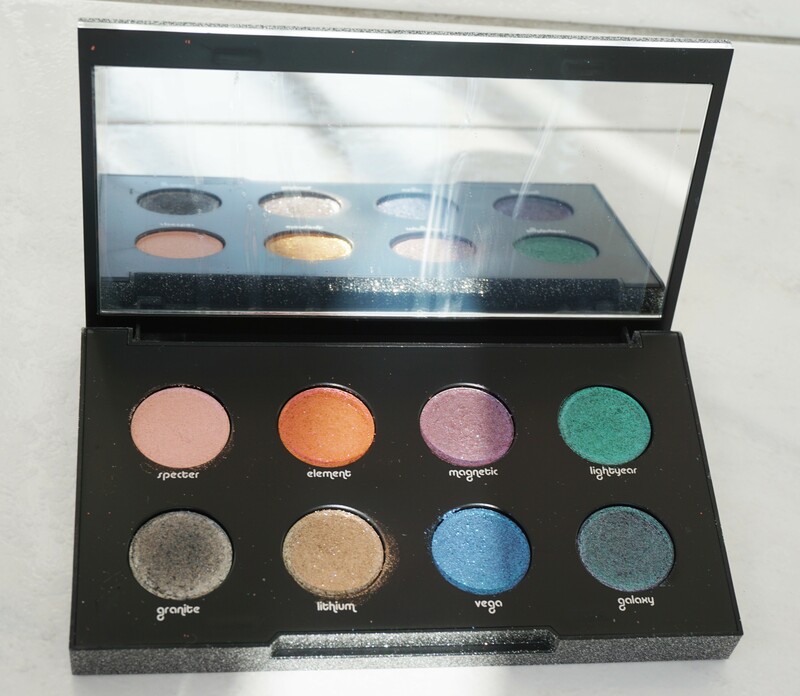 When opened, the palette has a mirror in the top lid part and eight eyeshadows in the bottom section (two rows containing four eyeshadows each). I love that there is such a wide range of shades included in the palette. I normally hover towards greens and purples when it comes to sparkly eyeshadows, so this palette gives me the chance to try different shades, such as chocolate-brown (like Lithium) and charcoal (like Granite). I sometimes find that sparkly eyeshadows can lack in pigment but, oh no, not these ones! 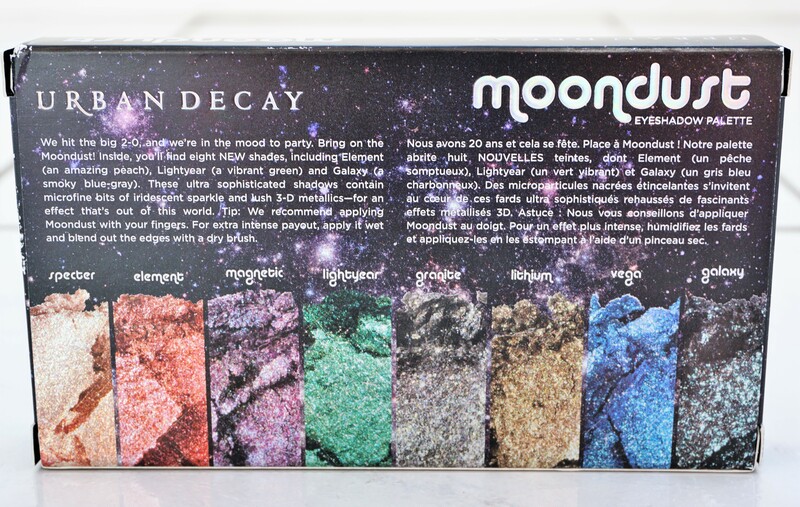 The eyeshadows in the Moondust palette are really pigmented and offer a wonderful blend of sparkle AND colour. Spectre is probably the most subtle out of the eight shadows (if you can call sparkly shades subtle), as it is a little more neutral and not as deep in tone as the other shades. I think this would be a really nice one to try if you want to introduce yourself to the shades in the palette more gently. The rest of the shades are sparkly, colourful and deeper in hue, so perhaps not as well suited to those who like a more toned down look. I can see myself reaching for this palette whenever I want to add a little extra ‘something’ to a look. I can imagine using it all over the lids for when I want a really eye-catching look. So far, I have tried out Element all over the lid and wow!!!! It looks so sparkly and pretty! I think simply dotting the eyeshadows in the inner corners or the middle of lids would be an alternative way of using these eyeshadows, particularly if you want to add some subtle glimmer without going for all-out sparkle. I think creamier eyeshadow bases (like MAC paintpots or Maybelline Colour Studio Cream Gel Eyeshadows) are a good bet when using sparkly eyeshadows, as they help the glitter base to adhere more effectively to the lids. You can also apply the eyeshadows wet (try misting your brush with a fixing spray or water before patting on to the lid) to really maximise the sparkle and holding power. Urban Decay suggest applying the eyeshadows with your fingers to help them adhere more effectively to the lids. You can also use a brush, if you prefer not to use your fingers. Using a flat shader brush and a patting motion will help sparkly eyeshadows adhere well to the lids. 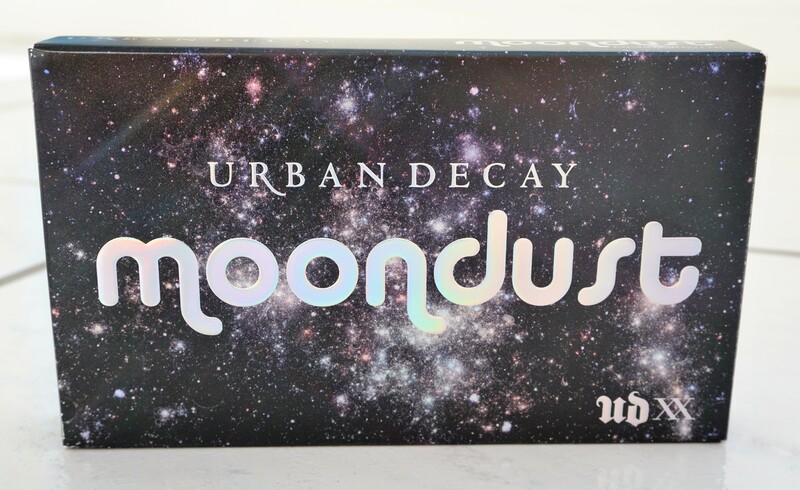 As mentioned above, the Urban Decay Moondust Eyeshadow Palette is now available as part of the permanent Urban Decay collection. It can be purchased from Debenhams, House of Fraser, on the Urban Decay official web page and from various online retailers. The palette costs £35 which, while not being cheap, does provide you with 8 different hues of Moondust eyeshadow. 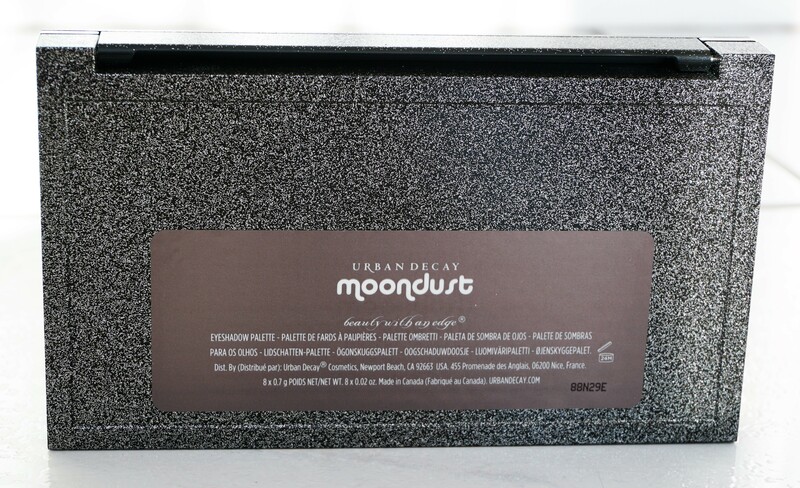 I think this would be a good option if you want to try out the Moondust formulation in a range of shades, without having to buy lots of different eyeshadow singles. It’s also a nice way to branch out of your comfort zone and use shades that you might not normally try (but are super pretty). 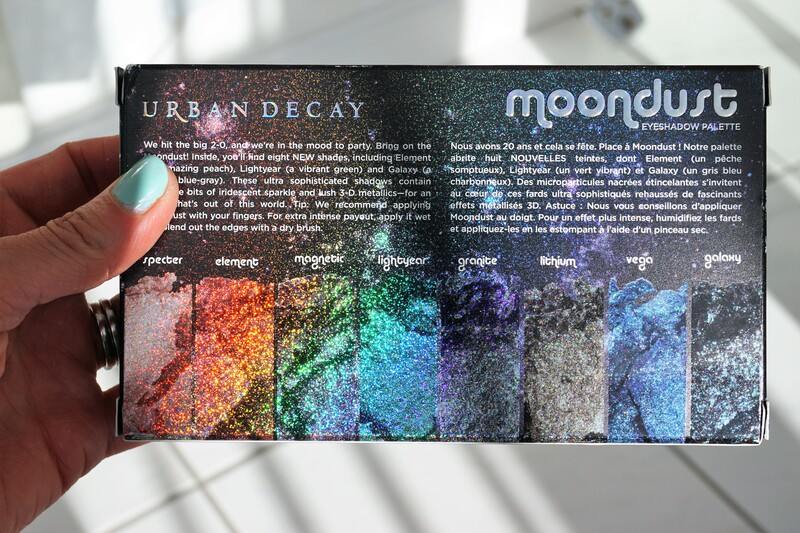 What are your thoughts on the Urban Decay Moondust Eyeshadow Palette? Have you tried it? Any good eyeshadow combinations? Let me know your thoughts in the comments section below. Hehe, yes, it is a super pretty palette! I think the bright colours and glitter make it a much bolder palette, so it might be less wearable for some. 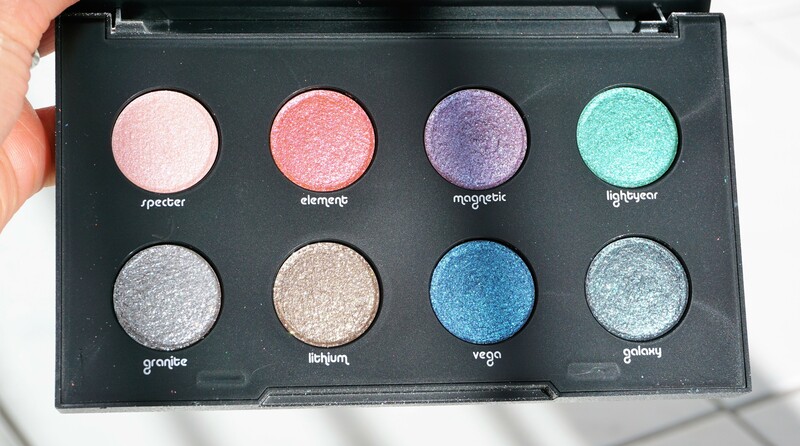 The Vice palettes probably offer more versatility in terms of colours and finishes. I think you could use it to apply little accents to an existing look e.g. along the upper lashline or in the outer corner. That would give a little ‘pop’ of colour without it being too overwhelming. The Moondust formulation is available as single eyeshadows too, so you might find a slightly more neutral shade in that range. I’ll see if I can come up with some toned down looks using the palette! Good challenge for me :o) .